Amazon has announced two new Echo companion devices in India, the Echo Link and Echo Link Amp. The two devices allow users to stream high fidelity audio to their existing stereo system. 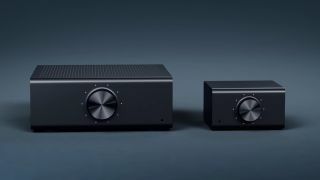 Amazon had unveiled the Echo Link and Link Amp back in 2018 which is aimed at audiophiles. With the Echo Link, users can modify their audio setup to include Alexa voice assistant which adds the ability to control music playback and adjust volume with voice commands. Though, you will need to have a compatible Echo device that supports Alexa. The Echo Link essentially functions as a bridge between broadcasting music to amplifier, receiver or headphones. It has multiple audio I/O which include analog RCA, subwoofer RCA, coaxial, optical, 3.5mm jack and RJ45 Ethernet port. Echo Link can also be configured to be used with a MP3 player, CD player or even a turntable. On the other hand, the Echo Link Amp has the same feature set and in addition includes 2 channel, 60W digital amplifier for hi-fi audio playback. Both the devices have volume control knobs for a granular control over audio playback. The Echo Link measures 4.5 x 5.3 x 2.7 inches while the Echo Link Amp is larger at 8.5 x 9.5 x 3.4 inches as it comes with a built-in amplifier. “Music is a big use case for customers using Alexa. Echo Link and the Echo Link Amp will help enhance this experience with high quality, immersive sound experience as well as a seamless integration of all key music sources in your home,” said Parag Gupta, Head at Amazon Devices, India. With the Echo Link devices, users can also create speaker groups that can be installed across their house to playback hi-fi music. Once the Echo Link or Link Amp has been deployed, it can be used with another Echo device that supports Alexa to play music and control volume. The music playback can also be monitored from the Alexa app after the Echo device has been connected with either of the Link devices. Amazon Echo Link is priced at Rs 19,999 whereas the Link Amp will retail for Rs 29,999. Both the Echo devices are currently on sale on Amazon India with Echo Link shipping to buyers from next week and Link Amp from early May 2019.